Eveything I am making at the moment seems to involve lots of small bits. This box contains 132 folded and pinned two-inch squares of silk. The piece below involves about 50 circles, cut and folded and stitched individually onto the vintage shot-rayon fabric. I was making this listening to a radio programme about Neil Diamond so it will forever be associated with him now. It’s funny how that happens. I do love making time-consuming one-off pieces like these, but I haven’t the patience to sit and work on the same piece all day, so I’ve got about 10 things on the go. It does mean I get some variety. Well, I get to cut out different fabrics and sew thing up into slightly different elements, endlessly. It’s been quite repetative this week so I gave myself a break and started work on my first Origin outfit. I’ve got to stand around looking fabulous for 6 days, so it’s a fine excuse for some advertising my dressmaking as well as my other stuff. I’ve cut a pattern from my absolute favourite vintage garment – a 1930s scallop-edged blouse which is falling to pieces from overuse. I’m going to make a new one in 1930s fabric which is also my absolute favourite. 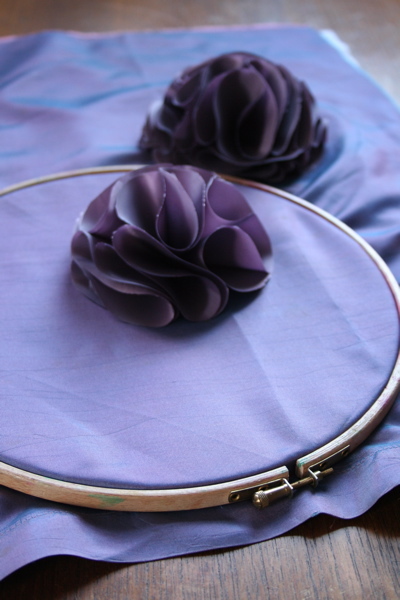 I’ve also started work on a reclaimed velvet curtain skirt, which I promise will be much more fabulous than it sounds! It was nice to work on a large scale again, drafting patterns and sewing up long seams. 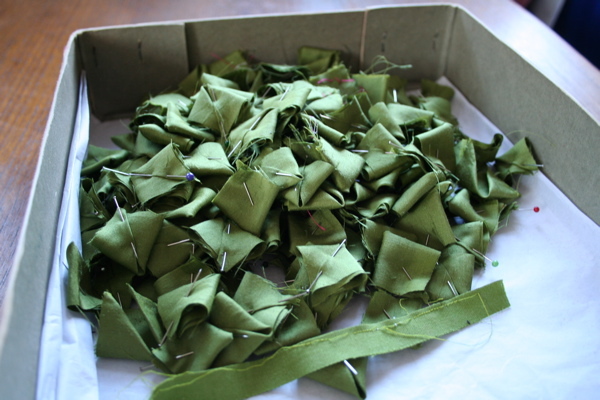 My sewing machines are pretty dusty – I’ve been doing lots of hand sewing recently. This outfit is going to be tested at a family party this weekend, along with a fabulous new apron which I am going to have to make if I’m dealing with food in this outfit! 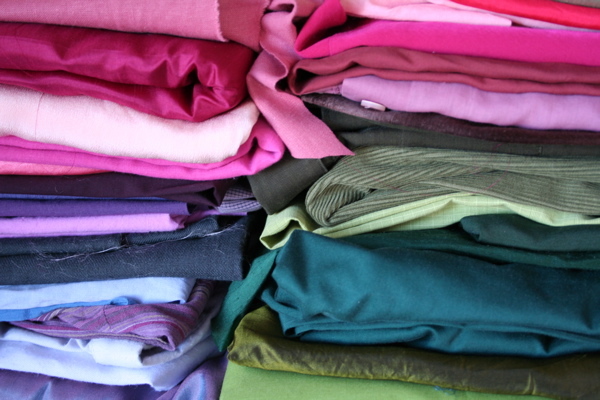 This pretty stack is some of the fabrics I’ve selected for my new cushions for Origin. I’m doing limited edition sets of co-ordinating cushions in a three colour-ways – pink, purple and green. The decision on colours was made for me simply by what was on the shelves that was re-used, recycled, organic or vintage. I’ve added a few second-hand shirts to increase the range, and I think this might be enough now!